But they're still open for possibilities. Before the latest extravehicular mission to change batteries in the International Space Station on March 29, NASA was faced with a dilemma: they don’t have enough medium-sized spacesuits that would allow the historic first all-female spacewalk. But the United States space agency isn’t going to make a new spacesuit in the near future. According to reports, NASA isn’t planning on changing the current ISS spacesuit configuration, a decision that drew major flaks from different relevant parties. In a news conference held yesterday, April 2, to discuss the agency’s plans for another spacewalk scheduled on April 8, NASA confirmed that the number of medium-sized spacesuits would remain the same and the possibility of an all-female spacewalk would not happen by then. The spacewalk on April 8 will be the third of the most recent out of ISS excursions by astronauts from NASA. 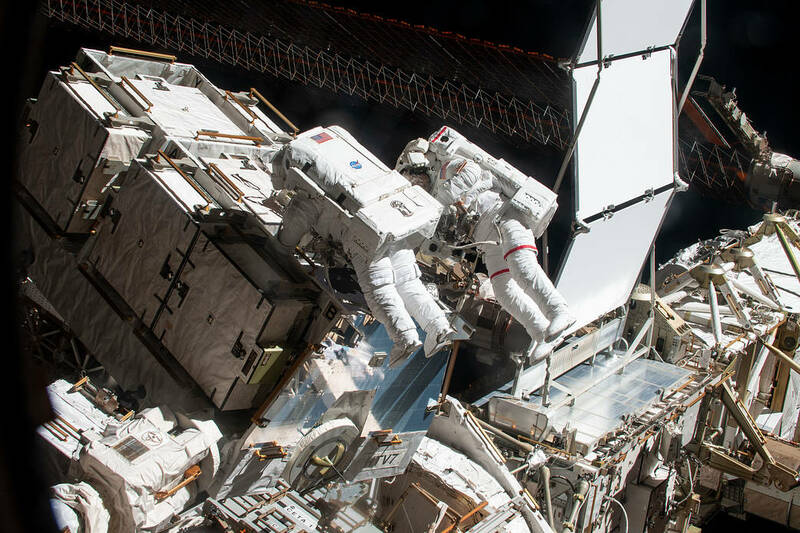 That spacewalk will be conducted by NASA astronaut Anne McClain and Canadian Space Agency astronaut David Saint-Jacques after crew assignment changes suggested by McClain after her first spacewalk on March 22. The new crew assignment follows McClains suggestion that she is much more comfortable wearing a medium-sized torso rather than a large-sized one. “After consulting with McClain and Hague following the first spacewalk, mission managers decided to adjust the assignments, due in part to spacesuit availability on the station,” NASA said in a statement signaling that the all-female spacewalk will happen some other time. The problem stems from the fact that there is no available medium-sized space suit. It would take hours of crew labor — not to mention some additional risk — to fix that in time for Friday. Ms. McClain had thought she would be able to work in a large-size torso, but after her spacewalk last Friday, she wore a medium-size body and learned that it fit her better. The solution of NASA is to adjust the assignments and switch out the astronauts. Amid the controversy, NASA assured that both female astronauts would be able to do the spacewalk together in the future. In a briefing at NASA’s Johnson Space Center in Houston last month, Ms. Lawrence, Ms. Kagey and Kenneth Todd, the station’s operations integration manager, said that officials did not immediately realize the significance of Friday’s ‘extravehicular activity (EVA)’ line up and what would it mean to women around the world. It was only later when they discussed the details of the mission that they realized that it would have been the first scheduled spacewalk done by an all-women crew. Ms. Schierholz said that while there is still no concrete plan for an all-female spacewalk in the future, she expressed its high likelihood because NASA astronauts have been diversifying in terms of gender. Nevertheless, the team behind the International Space Station mission will be supported by a team on the ground that includes some women in critical positions. Mary Lawrence is the flight director, and its lead officer is Jackie Kagey.